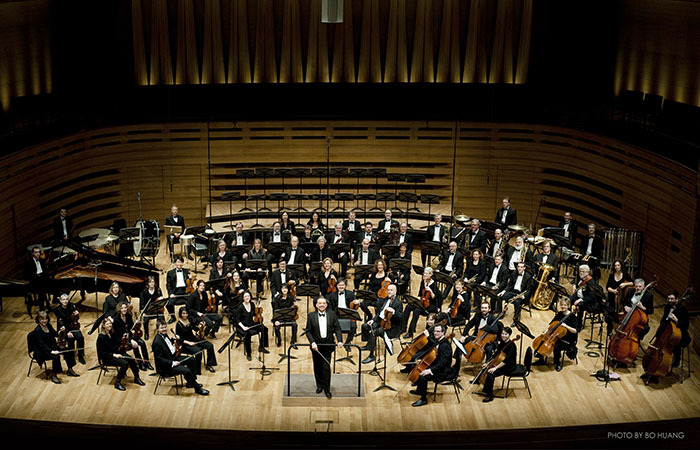 On Thursday January 29th at Koerner Hall, Esprit Orchestra, conducted by Alex Pauk, performs a concert featuring World Premieres of commissioned works by Canadian Samuel Andreyev and British composer Philip Cashian. The programme also includes the Canadian Premiere of a piece by Icelandic composer Daniel Bjarnason and a reprise of a work by Robert Aitken previously commissioned and premiered by Esprit. The piece was commissioned by the Los Angeles Philharmonic and Barbican, London and was premiered by the LA Phil New Music Group, conducted by John Adams, as part of the “Green Umbrella” series in October 2012 at the Walt Disney Hall. The work’s orchestral layout aims to create a “stereo” effect with the orchestra’s two pianos and two percussion set-ups being placed as far apart as possible “at opposite wide ends of the ensemble”. Robert Aitken appears as composer and flute soloist in the performance of his own Berceuse for flute and orchestra. The piece demonstrates Aitken’s impressive knowledge and mastery of the instrument as a performer (including extended techniques) and vivid imagination as a composer. In two contrasting movements, the work is dedicated to the memory of the composer’s father and bears the subtitle For Those Who Sleep Before Us. Samuel Andreyev, born in Kincardine, Ontario, has lived in France for the last several years. Among other honours, he was recipient of the 2012 Henri Dutilleux Prize in composition. Philip Cashian is Head of Composition at the Royal Academy of Music in London. Esprit’s premiere of his newest work marks the third time Esprit has performed his music. Daniel Bjarnason, a composer with a burgeoning international career and a strong connection to pop music, is based in Reykjavik. Robert Aitken, Artistic Director of Toronto’s New Music Concerts, has had much influence on contemporary music in Canada as a composer, performer, conductor and teacher.